4. How do I integrate a form of tracking? 5. How do I customize the options in the cookie selection box? 6. How can I check if the setup worked? Please disable your caching plugins while setting up Borlabs Cookie. You can then reactivate them. Make sure the checkbox Activate Borlabs Cookie in the Settings > Status tab is checked. If these steps were successful, the cookie selection box will be displayed when you visit the website. To ensure the function of Borlabs Cookie, plugins that were previously used to integrate Google Analytics and Facebook Pixel must be deactivated! Then you should set the shortcode [borlabs_cookie] so that the visitor can change the selection at any time. We recommend the privacy page of your website. You can use the following shortcodes to give the visitor the possibility to opt-out of Google Analytics and Facebook Pixel. Note: The opt-out of Google Analytics and Facebook Pixel is independent of the cookie selection box, i.e. a choice of option 2 of the cookie selection does not trigger an opt-out. The opt-out options can also be added to a button or link via the CSS classes borlabs-cookie-google-opt-out and borlabs-cookie-facebook-opt-out. If you do not integrate Google Analytics through our integrated solution, you can use the opt-out feature of Borlabs Cookie by inserting your tracking ID in the shortcode or link. This is not possible with Facebook Pixel for technical reasons, so use our integrated solution. How do I integrate a form of tracking? Borlabs Cookie distinguishes between Third-party and First-party cookies. In most cases you can ignore First-party cookies, as this field is only necessary for you if you use e.g. tracking code of a self-hosted Piwik/Matomo. In all other cases, only the fields under Third-party cookies are relevant to you. Once you have entered and saved your code or tracking IDs in the corresponding fields, tracking is integrated via Borlabs Cookie and the user receives the cookie selection box. This concerns Google Analytics and Facebook Pixel, but also Google Adsense and Google Tag Manager, as well as all other third party cookies. If you want to use Google Analytics, make sure you remove any previously used code for Google Analytics. Enter your tracking ID in the Google Analytics Tracking-ID field under Cookie option 1: Third-party cookies, save and Borlabs Cookie will now automatically implement the appropriate code, including IP anonymization (the anonymizeIp parameter is enabled by default). If you integrate Google Analytics via the Google Tag Manager, the field Google Analytics Tracking-ID must be empty. Enter your tracking ID in the Facebook Pixel-ID field under Cookie option 1: Third-party cookies, save and Borlabs Cookie will now automatically implement the appropriate code. 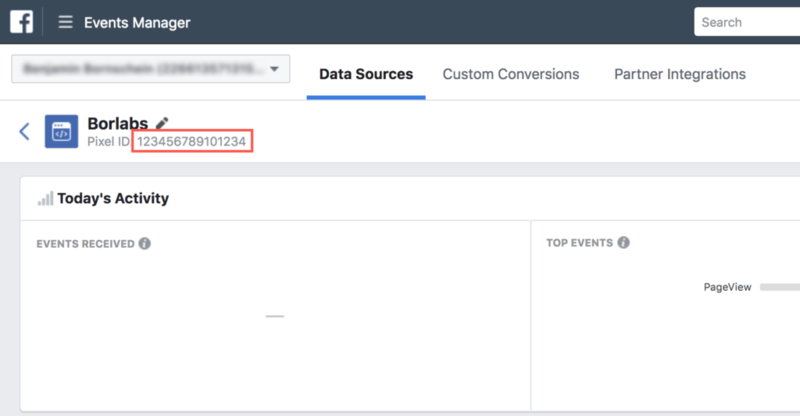 If you integrate Google Analytics via Google Tag Manager, the field Google Analytics Tracking-ID must be empty. Using the [borlabs_cookie_third_party] or [borlabs_cookie_first_party] shortcodes also displays the cookie selection box, even if all fields under Third-party and First-party cookies are empty. How do I customize the options in the cookie selection box? To verify that Borlabs Cookie has been successfully set up, we recommend the tool Ghostery. You can find out how to set up the tool and check your page in the article: How can I check if the setup worked? The Cookie box blocked xontent option can be used to prevent visitors from accessing the content of the page as long as they have not selected a cookie selection box option. With the Show cookie box option set to Always, you can always display the cookie box, even if you have not entered any code or short code. This is only useful in very rare cases and should therefore remain deactivated. With the Show cookie box option set to Never, the cookie box will not be displayed. With the shortcode [borlabs_cookie_blocked_content title="Your title"]] Your blocked content[/borlabs_cookie_blocked_content] you can block any content, similar to iframes. This function is not bound to one of the selectable options of the cookie selection box - but this can be activated optionally if required (including all iframes). See Automatically reload blocked content below. Click on the button below to load the content of EIN BILD. If you do not want to block a special iframe, you can set the attribute data-borlabs-cookie-iframe-spared.